Stay tuned to SWE-MN's LinkedIn, Facebook, and Twitter for up-to-date information on great social and professional development events as well as volunteer opportunities. 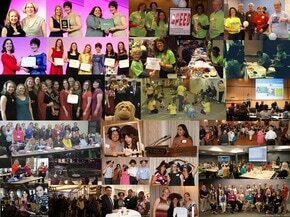 Have a passion for SWE at the local level? Interested in getting more involved on a specific committee, or co-chair leadership position? We hope to expand our SWE-MN leadership team for FY19, so please contact president@swe-mn.org if you have any interest, or would like more information. We are looking to expand our outreach activities into the Rochester area. If you are interested in assisting as a volunteer of any sort, or have any event idea leads, please let us know by completing this form! The SWE-MN Nominating Committee is excited to announce the Minnesota Section Slate of Candidates for the FY20 elections! FY20 ballots will be sent to all official SWE-MN members email boxes on April 1st. Please cast your vote during the month of April to elect our officers for FY2020. Details on all positions on the Executive Council (EC), elected and non-elected, can be found here. If you have any questions, please contact the nominating committee or FY19 SWE-MN President, Erin Syverson, president@swe-mn.org. SWE MN Professional Development Team would like to invite you to this year's Spring Seminar, sponsored and hosted by Optum. Join us for a full day of professional development sessions and networking! Attend session tracks targeted to various career levels and networking with fellow STEM professionals from the Twin Cities. Breakfast and lunch will be provided for you! We look forward to seeing you there! More details to come, registration is now open! SWE MN would like to invite you to join us at the upcoming Minnetronix Tour and Networking Event! Minnetronix Medical is in a dynamic environment of both contract manufacturing and developing our own medical devices. With just 300 people at the company, we've launched 5 new medical devices, built and shipping over 50,000 devices from 16 other commercial programs, and completed a clinical trial - all in the past year! Join us for a tour of our manufacturing facilities, following by a networking happy hour. Light appetizers and drinks will be provided. Space is limited so sign up fast to secure your spot on the tour!! Join SWE-MN at Wow! That's Engineering on Saturday, May 11th from 10 AM to 2:30 PM at Dunwoody College of Technology. The target audience for this annual SWE led event is local middle school girls who are on the reduced lunch program. Volunteers will lead attendees through a series of fun, hands-on experiments including lip balm, marble roller coasters, little bits, and brilliant bracelets. Sign-up to volunteer for this great event to help attendees think "Wow! That's Engineering" and "I can be an engineer too!" Questions: Contact the Outreach Committee at outreach@swe-mn.org to get involved in day-of volunteering! Please join SWE-MN as we recognize the successes and accomplishments of our section in FY19. All are invited to attend! Make sure to RSVP by May 13th in order to purchase your ticket. Note: Parking is available is through near-by ramps or street parking. The light rail also has a stop less than 1 block away. Looking for an opportunity to network and socialize with your fellow women engineers and allies? Please join us at our next SWE-MN happy hour. Did you enjoy the Fair State Brewing Events? Are you looking for more casual events with your fellow SWE-MN friends? You asked, and now we will be launching a SWE-MN Trivia event series! Join us at one or every trivia night! Trivia is Wednesdays at 7 PM at Fair State Brewing Cooperative in Minneapolis. We will be meeting before trivia around 6:30 PM each week. Looking for an opportunity to get to know your fellow SWE-MN members? Come to our next Coffee Networking event! Come join the Outreach committee during our meetings and get more involved in SWE-MN and help us encourage the next generation to pursue STEM. The Outreach committee meetings are open to all! Please RSVP with Jill Morris and Sherry Wu at outreach@swe-mn.org. Enjoy food and networking at the Society of Women Engineers monthly North Metro Lunches. If you're interested in coordinating these events in future let us know! ​Enjoy food and networking at the Society of Women Engineers monthly South West Metro Lunches. Enjoy food and networking at the Society of Women Engineers monthly Rochester Lunches. Dates alternate between the 2nd Wednesday and the 2nd Tuesday of the month. Enjoy food and networking at the Society of Women Engineers monthly South East Metro Lunches.